Michele at Crafts4Eternity is getting ready to release some Digital Stamps and here are 2 images she graciously allowed me to play with! 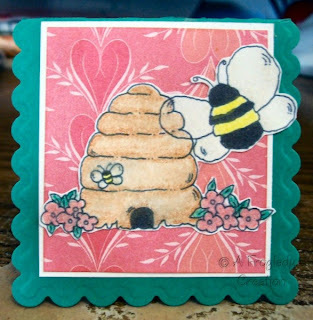 The bees above are done on a mini card to include with a small gift bag. 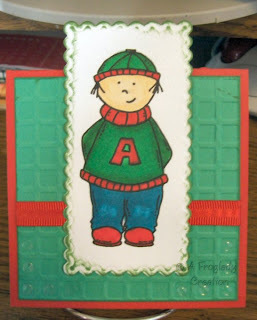 I cut the largest of the Scalloped Rectangles nesties and then folded it in half to make my card base. The stamp was printed on white paper with my Lexmark Inkjet Printer and colored with Prisma Watercolor Pencils. I blended with my SU blender pen. I then trimmed the image and mounted it onto some scraps of paper I had layered together. The bee wings and the flowers are also covered with Candle Light Shimmerz to add some sparkle to it. This little boy (Adam, Andrew, Alan?) was colored with Copic markers and then I cut him out using the middle Scalloped Ractangle nestie. I edged it with my inkpad and then mounted it on top of paper that I had run through my Cuttlebug with a Fiskars texture template. I ran a strip of ribbon across and added some clear dots to the corners ...just because LOL! The card base here is about 4"x4" and then the part of the rectangle sticking up makes it just shy of 5" tall so it still fits into a standard A2 mailing envelope. Michele I had a blast playing with these and I hope you like the cards I made so far. Love the images. They are just too cute. so cool, love what you did. Love the images, you showcased them very well.